Jeff MacConnie CFT, SPN, CLC / Owner. Mr Connecticut 2007, Heavyweight Bodybuilding Champion. Mr Connecticut 2009, Super Heavyweight & Masters overall Bodybuilding Champion. Mr. Connecticut 2012 Heavyweight Masters Bodybuilding Champion. 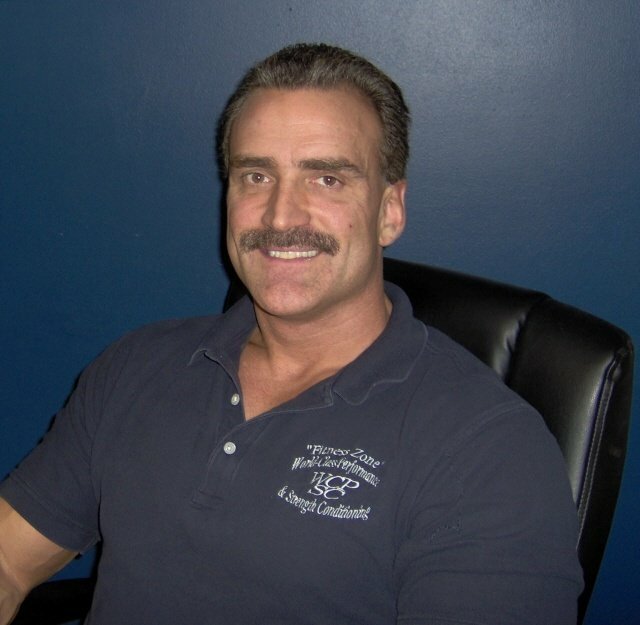 Jeff MacConnie, BSBA, CFT, SPN, CLC, is the owner of Fitness Zone World-Class Performance, and a member of the ISSA, International Sports Sciences Association, where he is Certified as a Fitness / Strength Trainer and a Specialist in Performance Nutrition. He earned a Bachelor of Science degree in Business Administration from Southern Connecticut State University in 1989. While earning a Bachelor Degree in business at Southern Connecticut, Jeff has filled most of his elective classes at SCSU with coaching, sports and nutrition classes. He also earned a Certificate of completion in Fitness, Bodybuilding and Nutrition at the Joe Weider Pro-bodybuilding camp in California in 1988, while training with some of the top IFBB Pro Bodybuilders, and learning from some of the top nutrition and strength professionals in the industry. Jeff has played football for 11 years from Pop Warner through College, and has been in bodybuilding and strength training for the past 25 years, and has acquired many honors.